Hittin’ that sweet spot for life! You are the pinata! When life takes a poke at you what comes out? You can only give away that which you have, right? Look around you to see what you’ve scattered when life blindly took a little jab at your outer protections. When you felt strung up, or got a beating in the past, what came out? Is it sweet stuff or not so sweet stuff? 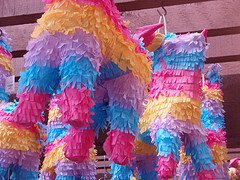 Be a Positive Pinata. Let all “the kids” around you be happy they know you. Did you know that study after study after study shows Positive People will have the following Deeeelicious treats to enjoy in life? That’s just a small sample goodie bag with 11 pieces of Candy for YOUR Life. The whole feast is wonderfully long and oh, so tasty and enjoyable. Best of all, it’s Free AND zero calories! Sure, you could fill up your pinata with creepy crawlers, and make it clear to everyone so they don’t come around pokin’ at you. But then You’ve got to spend your whole life feeling those creepy crawlers inside you. Yuck! Fill your pinata with the sweetest stuff! Attract others. Find a way to fill your pinata with Positivity every day, and enjoy the best Candy in Life. This blog is dedicated to my wonderful wife, Jeanne. She always helps fill my pinata with all the sweet stuff. Thanks Jeanne, I love you. This entry was posted in Daily Blogs and tagged Appreciation, FUN, Happiness, Law of Attraction, Life by MomentumMikey. Bookmark the permalink. Well said Mike! I hope all is well.